The subtitle of Rosemary Clewes' The Woman Who Went to the Moon is Poems of Igloolik which is what drew me to the book but is also what made me skeptical. Clewes is not from Nunavut and this collection of poetry is based upon a mere week-long visit. I've read far too many books by brief visitors to places (Newfoundland and Nunavut, especially) where suddenly the writers deem themselves experts, spouting off local cultural beliefs and customs (often incorrectly, often insensitively), offering solutions to local complex dilemmas, and all that jazz. 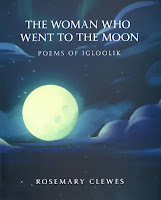 My reservations were not in the least assuaged by a blurb from poet John Reibetanz on the back cover in which he refers to the "woman shaman" supposedly invoked by Clewes and referring to the locals of Igloolik as Innu when they are in fact Inuit. Luckily, I think Clewes by and large takes a healthier approach in which the book comes across as a travelogue. Her outsider ignorance and inexperience is acknowledged up front and she shares her enthrallment and questions about the place, coming across more as gracious to the people and the nature she encountered, the hospitality, the teachings; never pretending to be superior or even now, one of them. while her focal points provided more than emotional enough resonance.